At first, Claudia hated going back to seventh grade. But things are definitely improving. She's on top of her schoolwork, she's made some great friends, and her new classmates really look up to her -- so much that they nominate her to be Queen of the Seventh Grade. 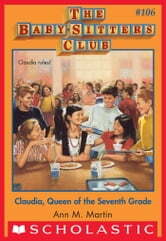 And when the votes come in, the results are clear: Claudia's not just adjusting to seventh grade, she's ruling it! The Baby-Sitters Club #95: Kristy + Bart? The Baby-Sitters Club #85: Claudia Kishi, Live from WSTO! The Baby-Sitters Club Super Special #12: Here Come the Bridesmaids! The Baby-Sitters Club Super Special #13: Aloha, Baby-Sitters! The Baby-Sitters Club #10: Logan Likes Mary Anne! The Baby-Sitters Club Super Special #1 : Baby-Sitters on Board! The Baby-Sitters Club Super Special #6: New York, New York! The Baby-Sitters Club Super Special #14: Baby-Sitters Club in the U.S.A. The Baby-Sitters Club Super Special #9: Starring the Baby-Sitters Club! The Baby-Sitters Club #28: Welcome Back, Stacey! The Baby-Sitters Club #56: Keep Out, Claudia!